Thorium is a naturally-occurring, slightly radioactive metal discovered in 1828 by the Swedish chemist Jons Jakob Berzelius, who named it after Thor, the Norse god of war. It is found in small amounts in most rocks and soils, where it is about three times more abundant than uranium. Soil commonly contains an average of around 6 parts per million (ppm) of thorium. 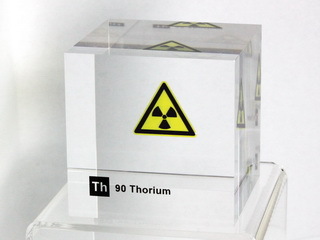 Thorium occurs in several minerals, the most common being the rare earth-thorium-phosphate mineral, monazite, which contains up to about 12% thorium oxide. There are substantial deposits in several countries (see table). Thorium-232 decays very slowly (its half-life is about three times the age of the earth) but other thorium isotopes occur in its and in uranium decay chains. Most of these are short-lived and hence much more radioactive than Th-232, though on a mass basis they are negligible. When pure, thorium is a silvery white metal that retains its lustre for several months. However, when it is contaminated with the oxide, thorium slowly tarnishes in air, becoming grey and eventually black. Thorium oxide (ThO2), also called thoria, has one of the highest melting points of all oxides (3300°C). When heated in air, thorium metal turnings ignite and burn brilliantly with a white light. Because of these properties, thorium has found applications in light bulb elements, lantern mantles, arc-light lamps, welding electrodes and heat-resistant ceramics. Glass containing thorium oxide has a high refractive index and dispersion and is used in high quality lenses for cameras and scientific instruments.